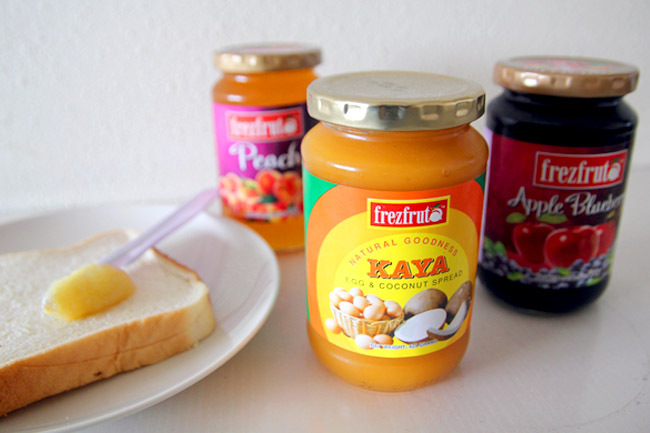 Daniel’s Food Diary is giving away 5 gift sets of Gold Kili and Frezfruta – This includes Gold Kili Double Shot Milk Tea, Double Shot White Coffee, Frezfruta Kaya, Peach Jam and Apple Blueberry Jam (formally known as Sinsin Jam). Leave a comment below to say you have done so. Results will be announced next Monday 11 June 2012. Contest winners must be residents of Singapore to facilitate delivery. This drink features the strong full-bodied taste of the finest Arabica Beans blended with a rich creamer. 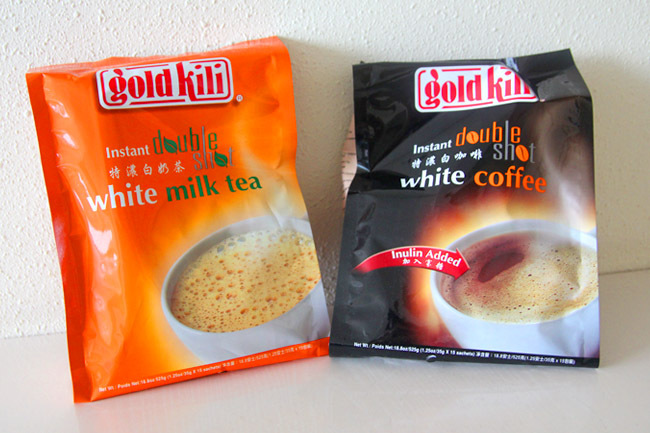 It is also the first instant coffee in the market that has the added benefits of Inulin*. Its called double shot because an extra shot of coffee gives its taste extra “oomph”. A rich, intensive fragrant tea extracted from premium grade black tea leaves. Its taste is reminiscent of Hong Kong’s famous si mat nai cha (“stocking milk tea”). An extra shot gives extra “oomph”. The first apple blueberry jam in the market made from IQF* fresh fruits, with a high fruit content of 50% – this is natural goodness at its best. Singaporeans love apple jams and blueberry jams so this is a marriage of the best flavors. IQF* fruits are frozen when the fruits are at its freshest, and IQF* fresh fruits make jams that are delicious, bottling freshness at its best. Made from IQF* fresh fruits with a high fruit content of 50%. This jam is natural, wholesome, flavorful and ever-so-popular. Completed the above steps. 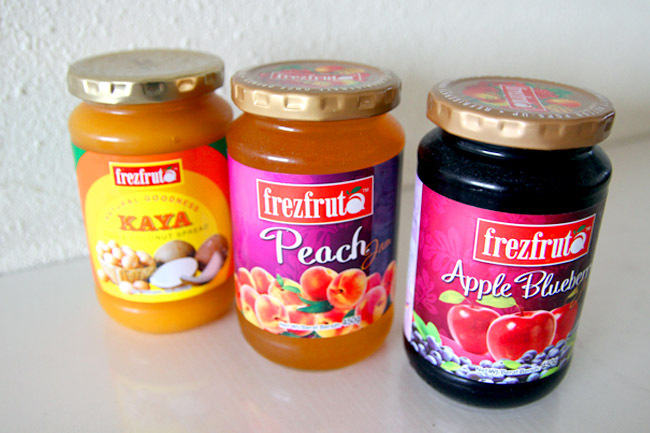 Used to Frezfruta jam, love them esp on waffle, yum. Liked. We all need a good cup of coffee in the morning to kick start the day! I’ve done the liking for both pages. Liked both Facebook Pages. Hope to win this and have a nice cup of coffee! Facebook name : Jess Chong. Like both FB pages. Liked and Shared as I love coffee and jam on toast! Steps completed! Am so hoping to win. Liked and shared both pages! Liked to a better breakfast with the products! Liked both facebook pages, and thanks for this yummy giveaway contest! I’ve completed the above steps. Hope I win! I’ve liked both Facebook pages. My facebook name: Hannah Ong, Fb email address: bananascented@live.com ! I love coffee, and I love sweet jam. Please pick me as one of the winners. Congrats to Sharon Ngo Hea Ming, Neo Hui Yan Eileen, Khar Hoong Lim, Darren Ong and Sylvia Cityofangels for winning 1 gift set of Gold Killi and Frezfruta jams from Lion City Distributions Pte Ltd . Please drop me an email at DanielFoodDiary@gmail.com with your name/contact/address and the suppliers would contact you soon!